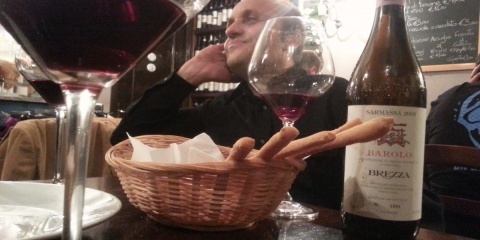 Seen any wines from Valle d’Aosta at YOUR local market lately? I am always impressed when I have the chance to visit a local market like PCC Natural Makets. In classic Seattle-fashion, this small chain of cooperative-run markets is fueled by the desire to build a community that offers local, healthy, sustainable food choices to its members and customers. This is the kind of progressive,self-governing attitude you’d expect from a Seattle institution. However you might be surprised to find that PCC has one of the most interesting and compelling wine selections. Ever. I stopped here with a colleague for a quick bite to eat, but was waylaid by the wine department’s extensive and esoteric selections. These PCC markets have the feel of your neighborhood grocer, but their beverage selection rivals some of my favorite specialty wine shops. I was especially excited to see the wines of Lo Triolet, a funky little Val d’Aosta wine producer who, in addition to selecting extremely difficult vineyard sites at over 900 meters above sea level, is doing some fun projects with unexpected grape varietals as well. Lo Triolet was born in 1993 when the Martin family had the idea to replant old Petit Rouge vineyards, high on the craggy, impossible mountainsides, with earlier-ripening varietals such as Pinot Gris and Pinot Noir. The resulting wines are strictly mineral, full of acidity and verve, but fleshed out by the cold, penetrating rays of sunshine afforded these terraced vineyards. They are magical, delicate, and extremely food-friendly wines. It’s easy to see how this wine department came about- Jeff Cox, self-described “wine guy”, has had almost 30 years in the business and clearly knows a thing or two about sourcing awesome vino. He’s also a fantastic writer- check him out on the PCC Wine Blog where Cox elaborates on a recent trip to Spain. If this doesn’t inspire you to get your passport renewed, I don’t know what would. If all of this isn’t enough to convince you of the merits of a co-operative run neighborhood market, PCC is also responsible for some of the best-tasting, healthiest “fast food” I have ever tasted. What more could you ask for- except maybe a glass of crisp, delightful, vino valdostano? Too bad we do not have of these here! Yes too bad… however I am sure I could find you a bottle of SOMETHING from Val d’Aosta… which retailer wine shop do you like to use? Aosta wines are really interesting mountain wines, and it’s good that you found Lo Triolet wines available in Seattle, and in a market too! It’s a shame though that they re-planted the Petit Rouge with ‘international’ varieties, though one can understand the commercial pressures at the time. Aosta has some wonderful indigenous grapes such as Petit Rouge, Vien de Nus and in particular Fumin for reds, for whites there is Petite Arvine (gorgeous grape that also grows in Valais, Switzerland) and a lovely version of Moscato. It’s a wonderful area that I hope to explore more soon. The world of Italian wine knows no boundaries. It’s always great when someone passes on their love of unknown wines. Valle d’Aosta will probably always remain unknown, even to most dedicated Italian wine lovers, which is a pity, given the quality of wines from this small region. Thanks so much for your comments! I totally agree, it is a pity that so much of the wine world will never know the fragile beauty of wines from Val d’Aosta! I Love Didier Gerbelle- thanks for mentioning your post here, too! We’ve been enjoying a nice Rosato from Valle d’ Aosta this summer. It is from a small cooperative called Cave de Donnas. The wine is Larmes du Paradis. It sounds as though I need to search out some reds now. Cheers! Wow! Rosato from Donnas… looked this up and found it is super geeky! A blend of 85% Picotendtro (as Nebbiolo is known in these parts) and 15% Freisa and Neyret. Excellent find, Vinoman!